With Born-Free being a two day event this year, I contacted Mike Davis, Born-Free co-owner, for the basics to help our readers get the most out of the event. You will notice many embedded links throughout the article, please take a moment to read the whole feature before leaving the site. Thanks! Admission to Born-Free: This year there is a $10.00 admission for per day. You can pay two different ways. The first method is to buy the BF Fast Pass wristband. The band is designed for the rider that wants their vintage bike inside the show grounds. It also will help you get in earlier, quicker and with less disruption than those without it. It will also guarantee your bike will be parked inside the show and not out in the parking lot. If you have a passenger on the bike they need a Fast Pass too. So if you want a shot at winning an award ,your bike to been seen or simply want it inside the show you need to buy a Fast Pass wristband. This Fast Pass is not for those driving a car or those not wanting their bike inside the show. Those folks will go with method two. You simply park in the parking lot and pay at the gate. You will receive an entry band once paid. That's it! To buy a Fast Pass wristband go to Lowbrow Customs Born-Free page. http://www.lowbrowcustoms.com/p3460/buy/misc/born-free-6/born-free-show-admission-quot-fast-pass-quot-wristband-saturday-june-28th/ Online Cut Off for Fast Pass wristbands is Monday June 16th. So don't wait! Saturday June 28th: We are doing the Invited Builder awards presentation and giving away one of the participating 12 Invited Builder bikes or the winner of the Show Class Magazine People's Champ promo's bike at approximately 4 pm. Visit the Born-Free Site www.bornfreeshow.com for complete list a builders participating in the Giveaway Promo. Sunday June 29th: We are doing all the regular awards, approximately 18, The Best In Show & Born-Free Awards and our newest award "The Most Outstanding Motorcycle". We are also giving away the 1947 Knucklehead built by Todd Astin at Small City Cycles in Boise Idaho. The Awards will all begin at approximately 3pm and giveaway to follow. So what does this mean to you? If you want to win one of the participating invited builder bikes or the Show Class People's Champ bike you must be present on Saturday. If you want to win the 1947 Knucklehead you must be present on Sunday. YOU MUST BE PRESENT TO WIN THE MOTORCYCLES. To enter the promo visit the Lowbrow Customs Born-Free page and buy a poster w/ free ticket that will enter you to win. http://www.lowbrowcustoms.com/p3312/buy/misc/born-free-6/born-free-show-born-free-6-poster-amp-raffle-ticket/ Online Cut Off for Poster / Ticket Combo that enter you win is Monday June 16th. After the cut off date you will need to buy at the show if we have not sold out. The Awards: The general awards will work as follows: On Saturday the judges will be roaming the grounds searching for their favorite bikes in the categories they have been assigned to judge. The bikes they pick and it could be several in their category will get a sticker on the headlight. It will say "you have been picked"! If you get one of these stickers come to the Born-Free booth and register. This does not mean you have won, it means you need to come back on Sunday, and you are in the running to win your category. We will probably have some kinda goodie bag for you too. On Sunday, the judges will go back out, search the grounds for the bikes they did not see on Saturday, and make sure the bikes they tagged are present then select the winner. It's pretty straight forward and simple. We will do the same thing for Best In Show, Born-Free and the Most Outstanding Motorcycle awards. Remember the winner of the Best In Show winner will come from the crowd not from the invited builders. 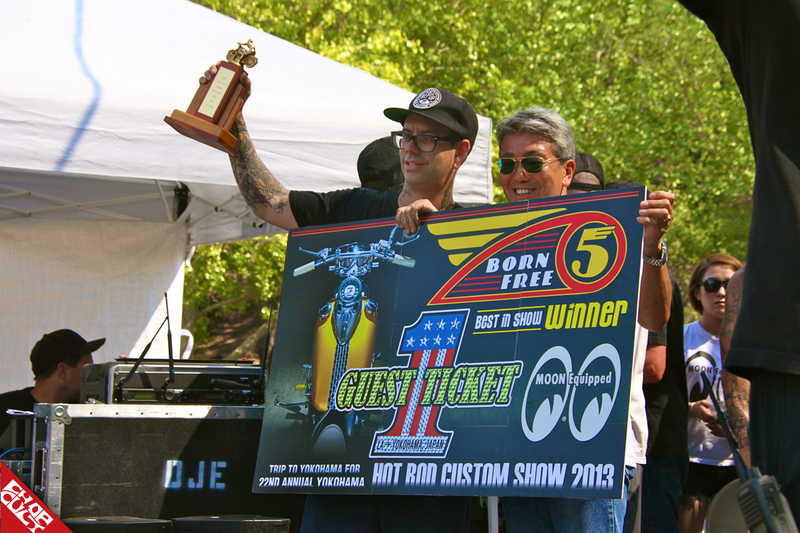 The winner will also win a trip to Mooneyes HRCS in Japan with their bike in December. This year more than ever our judges and us will be looking at every bike possible to find the best of the best. If your bike is hidden in a vendor booth it will be tough to find, please don't make it tough to find. So get those bikes done and to the show. Born-Free also has a new website www.bornfreeshow.com for the latest news, builder updates, show info and more. We also have new You Tube Channel loaded with videos https://www.youtube.com/user/bornfreeshow/videos We have the Born-Free Blog for up to the minute info http://bornfreeshow.blogspot.com/ and lastly if you need more content , our Instagram is @BORNFREESHOW .